We may think of Valentine’s Day as a human custom, but it seems that skunks celebrate it, too. Awakening from their winter slumber in mid-February—or a tad later farther north—male and female skunks quickly slip into a romantic mood and begin seeking one another’s company. Yes, love is in the air, and it’s pretty clear what they have in mind! 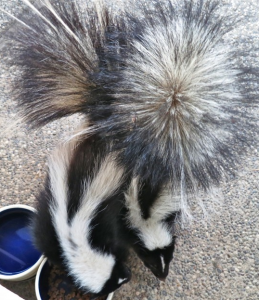 Here’s a little peek into the secret life of skunks, along with helpful tips for you as a homeowner when you smell love in the air. Skunks do not take kindly to winter’s woes—cold temperatures, howling winds, scant food supplies… who can blame them? So, they hole up in an abandoned burrow of a woodchuck, fox, or other burrowing animal, or excavate one for themselves, complete with a grass-lined sleeping chamber. Striped skunks (Mephitis mephitis) are seen throughout the U.S, into Canada, and in northernmost Mexico. Or, they may den beneath a porch, deck, or shed—or even under a house, especially if there are perimeter gaps or openings they can take advantage of. When settling in for the Big Sleep, females sometimes den together, sharing body warmth. Though not true hibernators, they enter a state of torpor or inactivity, slowing their metabolism to survive for weeks without foraging. Depending on their location some skunks may lose up to 65% of their weight as they overwinter. 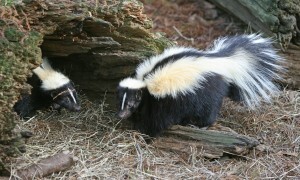 Skunks become active for a short time beginning in February when it is time to mate. 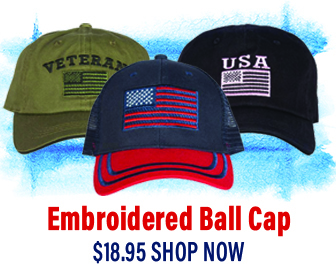 And depending on where you are in the country this may not begin in earnest until March or April. Once it warms up, though, mating can continue into mid to late April. Skunks only have one brood per year, but females who are not pregnant by May will have a second cycle of fertility, giving them another chance to have young later in the year. Searching for a mate may include nightly excursions of up to 2.5 miles. Once a romantic union occurs, a female skunk will attack any other males who approach her. Male skunks, however, have a different approach. Their goal is to mate with all fertile females within their home range. When the gals aren’t in the mood, they spritz the males. 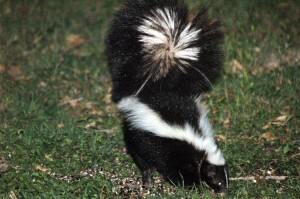 This is why mating season results in so many complaints from horrified, nose-holding homeowners, many who wrongly suppose from the stinky evidence that they have a skunk taking up residence somewhere around their home. If you do notice a persistent musky smell coming from under your porch, deck, or shed, you may have a skunk denning there. Before deciding to evict them, consider the very useful services they provide—consuming a wide variety of insects and rodents that many people consider pests, such as mice, baby rats, Japanese beetles, and most insect garden eaters. If their presence creates an inconvenience, though, try to be patient until after the coldest parts of winter, or until after the young are no longer dependent. Then, follow these tips to encourage them to move along. Once you are sure they have left, seal the opening to prevent future unwanted use of the space by skunks and other burrowing wildlife. However you may feel about skunks being in your yard, they are a highly beneficial part of the ecosystem, so any steps you take to discourage them should not harm them. Avoid feeding pets outdoors to keep from attracting skunks. If you must, remove food bowls when they are finished. Try to eliminate attractants, such as pet food left on the porch at night,unsecured garbage, and access to spaces that make good denning spots (but make sure they aren’t IN those spaces before sealing them). Keep garage and shed doors closed, as skunks may enter to explore or are attracted to garbage or bird seed stored in the garage/shed. Make sure you have covers over your window wells—in mating season, skunks commonly fall into these pits. Pre-made window well covers are available at home building or hardware stores. Don’t overwater your lawn, as this pushes grubs—a favorite food for skunks—to the surface, encouraging them to dig little holes in your lawn so they can get at the grubs. Skunks only spray when they feel threatened, and they give warning signs before they do it—stamping their front feet, raising their tail, hissing, making little “charges” toward the perceived threat, and, finally, turning their hind end in your direction. Slowly and quietly move away from these myopic members of Mephitidae and they will calm down and head the other way. Unfortunately, dogs usually don’t heed these very clear warning signals, so keep them within your fenced yard or on a leash to reduce the chances of a confrontation during this time of year. If your dog gets sprayed, find helpful suggestions here. It is extremely rare for people to get sprayed because, unlike a dog, most people don’t run up to skunks and try to grab them! Heed the warning signs given by a skunk before it sprays to avoid getting hit. Skunks do become more active when “love is in the air” and may show up in places they’re not typically seen as they search for mates or den sites. But, just like at other times, the most important thing to remember about these gentle animals is that they truly mean no harm. Just give them a little space so they can go on their way and nobody gets sprayed!